When we think of oppression, we usually think of war-torn countries, evil dictators and corrupt governments. While all of these are true, and doing something and spreading awareness about it are certainly noble causes, we usually forget to look at the one thing that we can actually make an immediate difference to – ourselves. Maybe we’re thinking – me committing oppression? No way! Not paying back the money we owe is zulm. Not returning something that we borrow is zulm. Not fulfilling an amanah towards others is zulm. ‘Disappearing’ for a period of time from our work without consent is zulm. Revealing someone else’s secret is zulm. Backbiting people, slandering them, and spreading tales about them is zulm. Disrespecting our parents is zulm. Cheating on one’s spouse is zulm. Behaving loudly in one’s neighbourhood is zulm. Withholding sustenance from one’s pets is zulm. All of these, and more, are a form of oppression. And the greatest form of zulm is to commit shirk. [Zulm] literally means to put something in a place that it does not belong, to misplace rights. So if a person withholds a right from their spouse / family / community – a right that has been mandated by Allah SWT – even if there is no screaming or yelling involved, it is still a form of zulm. It also means that everytime we sin, we’re actually committing a form of oppression upon ourselves, because we’re not giving ourselves our due right, because we’re exposing ourselves to Allah’s punishment. We sacrifice BOTH the Love of Allah and His Guidance if we do zulm. We sacrifice BOTH of Allah’s Love and Guidance. Subhanallah. If we lose these two Divine blessings, then how can we ever function? Zulm forms such a shell on a person’s heart, that it causes that person to lose the Love of Allah as well as losing the capacity to receive Guidance. If he ﷺ used to be so afraid of doing injustice, then where does this leave us? So I remind myself and then others: Do not consciously wrong ourselves through shirk or committing sins. We are all human, we’re bound to make mistakes, but CONSCIOUSLY committing sins is of a different level. Stay away from those seemingly ‘innocent’ paths that will eventually lead us to sinning. One of the main takeaway lessons from this hadith Qudsi is this: Allah SWT is so good to us, we should therefore be good to one another. He SWT has made oppression forbidden upon Himself, then who are you to oppress another slave of Allah? And lastly, always ask the protection of Allah SWT from committing zulm just like how Rasulallah ﷺ did. We seek refuge with Allah SWT from oppressing anyone, and being oppressed by others, and may He SWT help us be just in all of our affairs. May Allah SWT help those who are oppressed all around the world and bring an end to the tyranny of their oppressors. 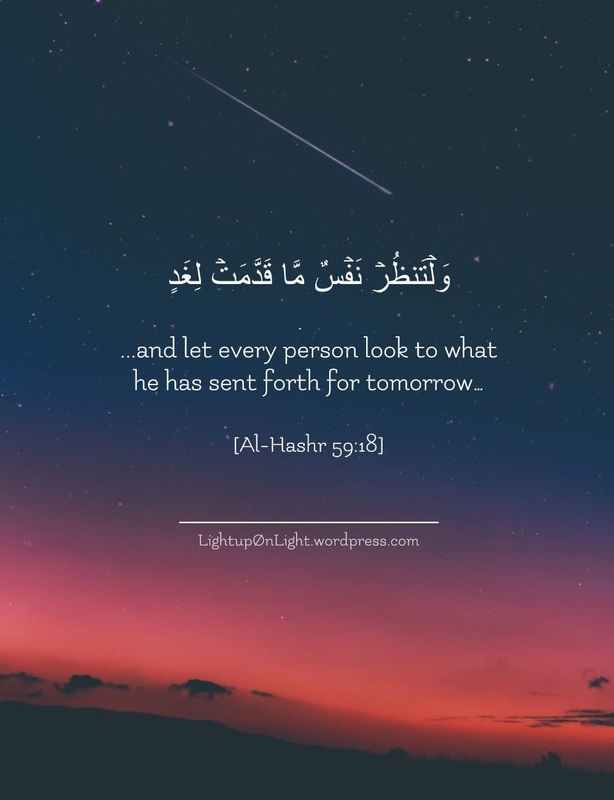 Allah SWT tells us in the Qur’an, that as a matter of fact, we will certainly be tested. Every person will be tested in some capacity. Some are not tested with their health, but with their family. And there are some who are not tested with their family or health, but with their careers, wealth, reputation, or even faith. The point is, every person has a unique set of tests that they go through in life. There are times we see people go through tests that we personally feel confident of overcoming if they were to happen to us. Maybe because we’ve attended lectures about patience, studied it numerous times, so we think we got this. But when those tests actually hit us – despite learning, talking and preaching about those concepts, theories and principles – we reel. We struggle. Why? Because the learned is not the same as the experienced. Because at that point, it’s not just about knowing tconcepts anymore, but it’s about how much we’ve truly internalized and absorbed them in our heart. Abu Darda RA said, “Verily, knowledge only comes by learning, and forbearance only comes by cultivating forbearance.”  Patience and forbearance are achieved through PRACTICING them. It won’t happen just through learning and talking about it. “…And whoever remains patient, Allah will make him patient. Sulayman ibn Qasim said that the reward of every deed is known, except for the reward of patience, which will be like heavy rain. May Allah SWT help us to cultivate patience, to be patient for His sake, and to remain istiqamah in patience until the day we return to Him. Allahumma ameen. “Woe to Al-Mutaffifun (those who give less in measure). In a meeting / discussion, how many of us want people to accept our ideas and opinions, yet we ourselves refuse to entertain the ideas of others? How many of us get super enraged when someone block our car in a parking lot, but we find no qualm to do exactly the same to others? If an employee takes his full salary, but does not work for the full required hours, then this too comes under the definition of Al-Mutaffifun. Indeed we live in an egocentric / kiasu world, where society taught us to be opportunists, regardless of moral principles. But our ways should always be guided by the Qur’an and Sunnah, not what’s ‘normal’ in society. We may get away scot-free now, but every single ounce of our misdeed in every single dealing that we did will be brought forth on the Day of Judgment. then none will be dealt with unjustly in anything. And if there be the weight of a mustard seed, We will bring it. Nay! Verily, man does transgress. Because he considers himself self-sufficient. There is a quote that says, power tends to corrupt, and absolute power corrupts absolutely. Such is the nature of man. But there is a hidden gem, a lesson in Surah Al-Mulk regarding this. That even though the Surah speaks about Allah’s Sovereignty, the Surah also mentions the Name Ar-Rahman multiple times, in a span of just 30 ayat. Saying that yes, Allah s.w.t. is Al-Malik, but He is also Ar-Rahman. This is important. Let this be a reminder to those who have been given some sort of power, wealth, status or intellect over others to be merciful to one another. Use Hikmah in your dealings with others. This is truly a forgotten Sunnah – especially on the social media. The more prominent you are, the more people look up to you, and the bigger impact your character has in your community.